We learn quite a lot about the feisty heroine, Alex, in the prologue of Ilsa J. Bick’s dynamite YA novel, Ashes. She’s stubborn. Aunt Hannah tells us that. “…once you’ve made up your mind, there’s no talking to you,” she says. She’s seventeen. And she has “a brain tumor the size of a tennis ball” lodged in her head. Alex is on the run, sort of. She’s decided not to do any more of the experimental treatments for her brain tumor – so she’s left her Aunt Hannah and headed to Waucamaw Wilderness in Michigan to clear her head and scatter the ashes of her parents, who had been killed in a helicopter crash. Alex is enjoying the solitude of the woods until Jack, his granddaughter, Ellie and their dog Mina happen by. Ellie is eight and is clearly not happy to be tramping through the woods. By page 25, Jack is dead and Alex and Ellie are running for their lives. The boy and girl were eating. Stuffing their faces, actually. Splashes of blood smeared their mouths and dripped over their chins like runny clown’s makeup. With a grunt, the boy plunged his fist into the woman’s abdomen and rooted around before coming back up with a drippy fistful of something liverish and soft enough that Alex could hear the squelch as the meaty thing oozed between his fists. It’s a waking nightmare. But these flesh eating teens aren’t the only thing Alex has to contend with. For one thing, she’s completely cut off from the rest of the world. She is quickly running out of supplies. Winter is coming. This is one of those no-holds-barred works of fiction that teens will love. I think boys will especially love it because it really has a gross-out factor. As the story went on, it did make me think about Patrick Ness’s novel The Knife of Never Letting Go a little. Like that book, Bick’s novel stretches out beyond the confines of teen against supernatural/fantasy/strange forces/etc and starts to tackle some other questions. What does it mean to be free, for example. Who is trustworthy and how can we be sure they don’t just have a personal agenda? Ashes has a crazy mythology: part religious fanaticism, part survival of the fittest. As Alex tries to figure out what has happened to the world…and herself (because she isn’t the same anymore either), Bick continues to introduce new perils and characters we must decide – as must Alex – whether or not we can trust. 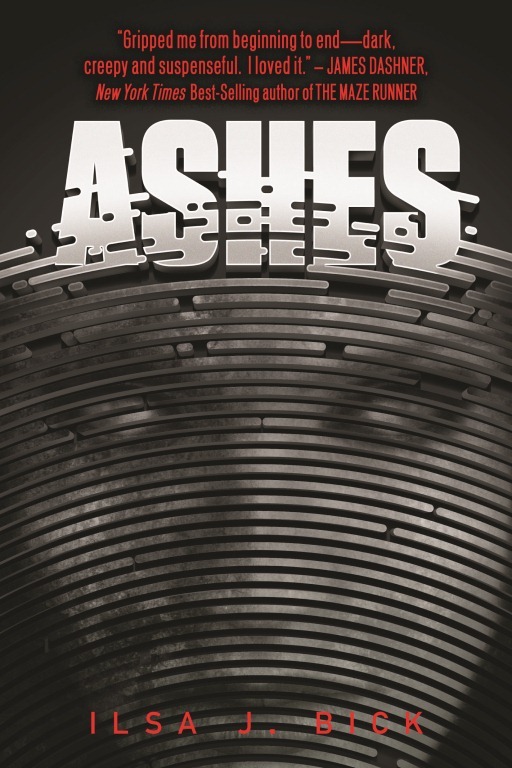 Ashes is the first book in a trilogy and I will definitely be continuing on with the series. Bick’s writing is crisp and fast-paced. Alex is a great character – smart and resourceful. Although the book is written in the third person, it’s a limited point of view – so it feels like first person narration. You really do see everything through Alex’s filter. This entry was posted in 365 Days 2012 and tagged 2012, explicit, highly recommended, YA by Christie. Bookmark the permalink. Hmmm, I’ve been curious about this one a lot. The gross-out factor, though, just turned me off! I’m not much for gross! Well, the part I quoted is the worst bit. Bick is smart enough to leave the rest to our imaginations. I liked the book.